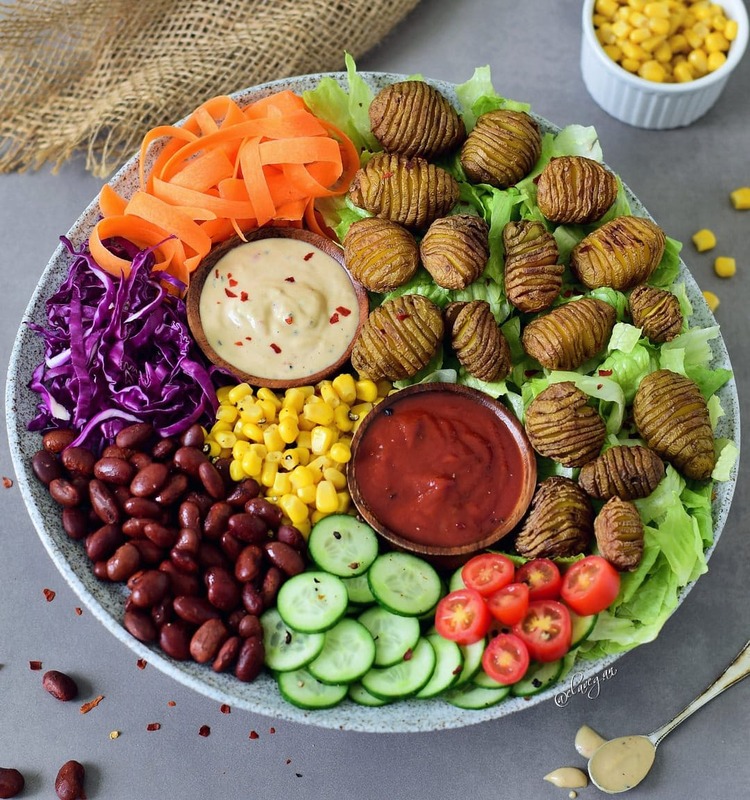 I love to make a healthy vegan lunch bowl because it’s packed with plant-based protein, carbs, fat, vitamins, minerals, antioxidants, and fiber which my body needs. 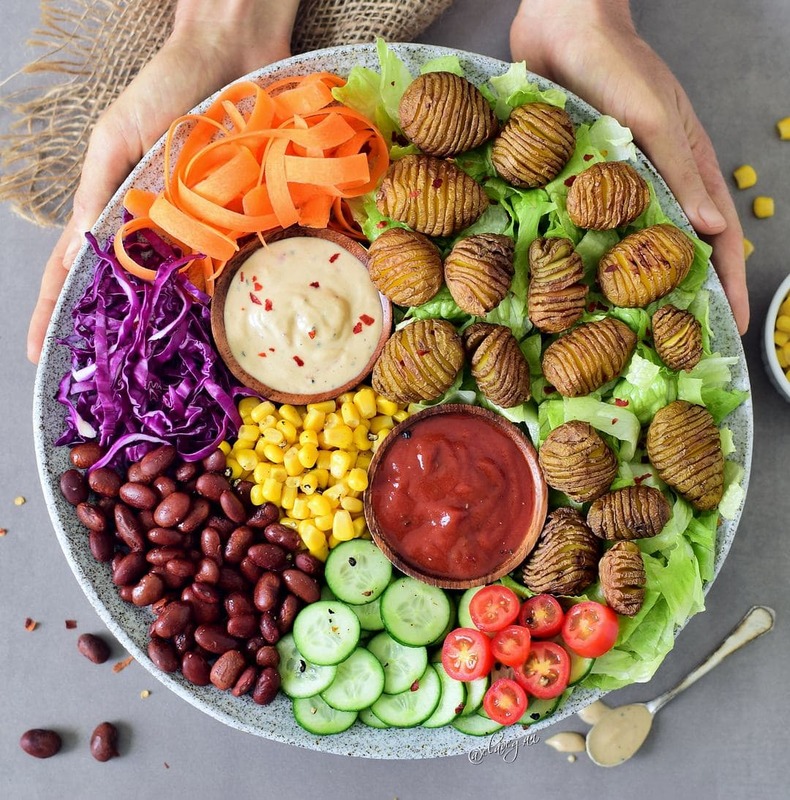 Making a healthy lunch bowl is easy and you can combine all your favorite veggies, greens and furthermore add legumes and grains, pasta or potatoes. 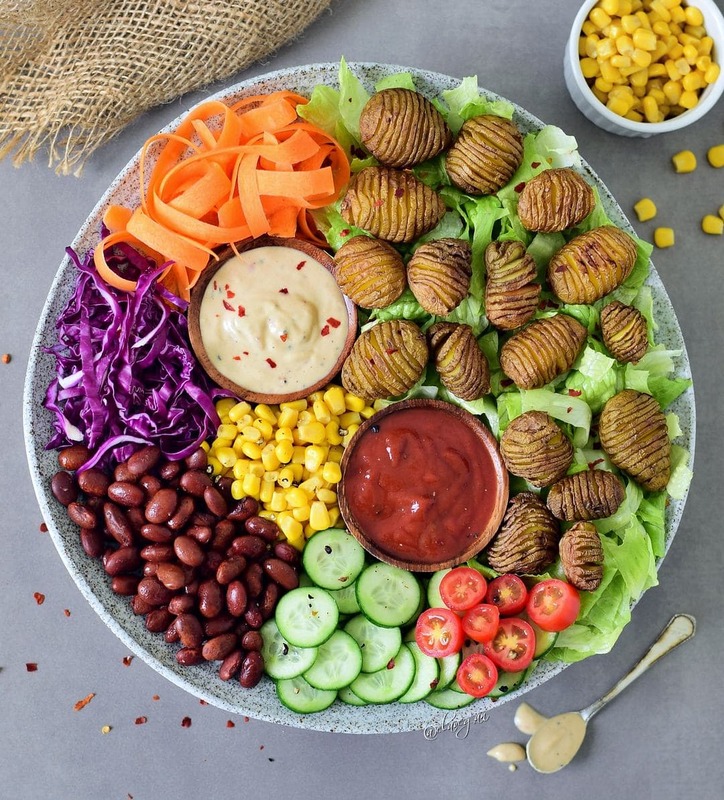 For this vegan lunch bowl, I chose to add Hasselback potatoes because not only are they delicious but they also look pretty amazing, right? In this blog post, I will explain how to make Hasselback potatoes and I will also share my favorite sauce recipes. I made two different ones, one is a creamy tahini sauce and the other one is a spicy tomato sauce. 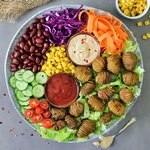 They are very easy to make and the perfect addition to this delicious vegan lunch bowl. I love to add all kind of colorful veggies to my lunch bowl but the following ones are my standard veggies which I use every single day: Carrot, cucumber, tomatoes, red cabbage, and zucchini. However, you can use your favorite veggies and add as many as you want. For example, I often include kale, white cabbage, peppers, and lettuce. 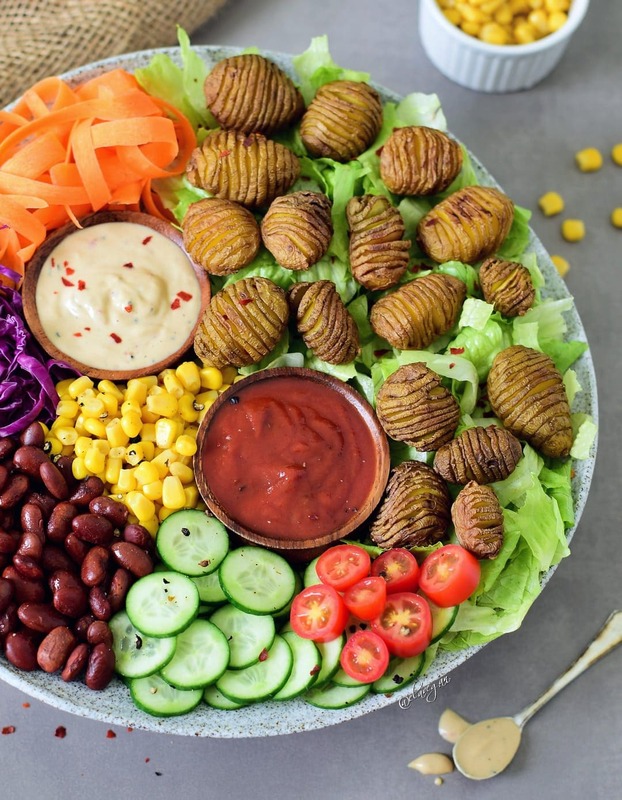 Normally I prepare my salad with raw veggies only, but sometimes I also add roasted chickpeas and noodles as you can see in this vegan buddha bowl. I make it a daily habit to eat a healthy vegan lunch bowl as it just feels good to nourish my body with so many nutrients. To be honest, I can actually tell the difference whether I had a lunch with many raw veggies or a cooked meal without raw veggies. When I eat a colorful healthy vegan lunch bowl I am not as full afterward and more focused throughout the day. Plus when I eat something healthy for lunch, I can have one or two of these ultra fudgy, gooey, and yummy vegan brownies as an afternoon snack. Yes, I am the girl who loves to eat rainbow salads and brownies, lol. If you haven’t tried out Hasselback potatoes yet, you are really missing out. Hasselback potatoes are very popular in Sweden, as it’s a Swedish dish. It was invented at the restaurant school “Hasselbacken” in Stockholm, Sweden in the year 1955. I often use mini potatoes to make Hasselback potatoes because they cook faster in the oven and furthermore they look cute. I hope you will enjoy my recipe. If you try it out please leave a comment below and/or tag me in your Instagram or Facebook post with @elavegan. Please don’t forget to include the hashtag #elavegan otherwise, I will miss your post. You can also direct message me your photos which I will happily share on my Insta stories. Preheat oven to 375°F, wash potatoes. Start making vertical cuts width-wise through the potatoes. Make sure not to cut all the way through, it helps to put chopsticks beside the potato (one from each side). Place sliced potatoes on a baking sheet, then brush the sliced tops with some oil (that's optional but they will be more crispy), and add salt and pepper to taste. You can add rosemary, cumin, thyme, paprika, and garlic as well. Bake in the oven for about 50-60 minutes until crispy. Yes, I’m also a girl who likes to eat rainbow salads and chocolate brownies hehe. I need to eat more raw veggies during the day and see how I feel – thanks for the inspiration! I really need to adopt your rainbow mid-day meal habit too, I am all too guilty of just snacking on fruit and veg and recipe trials straight through lunch and never pausing for a real meal???? 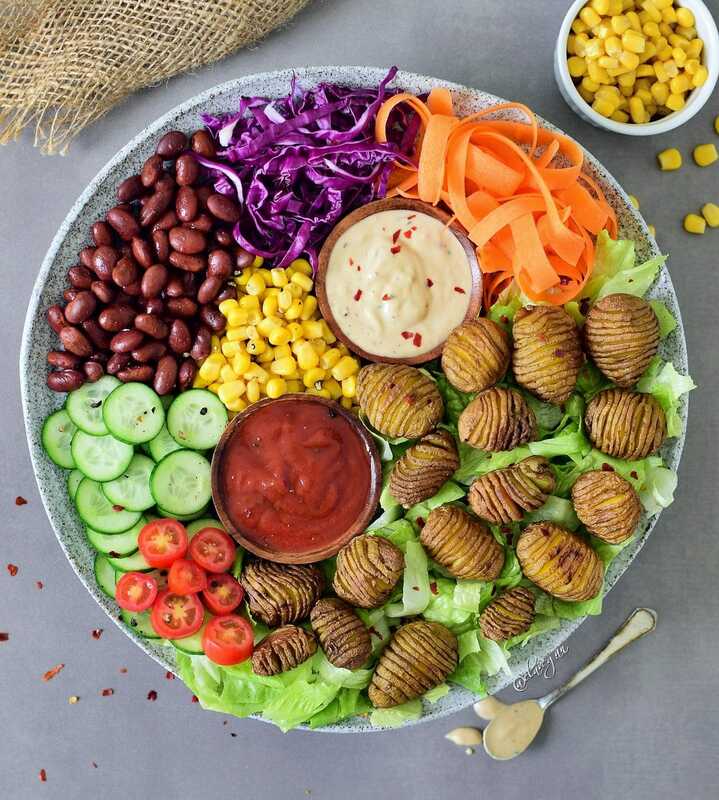 But I totally do feel a difference too when I put in the effort, even if it’s not quite this pretty (because mine never are lol) I love how big and abundantly colorful your bowls always are Ela, and this one is especially perfect for cooler months with the potatoes added on top too! Both sauces for me please???? This is such a beautiful and hearty bowl Ela! I love all the different veggies you use! I love veggies as much as I love dessert but I admit I eat them cooked more often than raw. It’s not that I don’t like them raw, it’s just that I cook more cooked type of comfort meals as opposed to raw dishes. I do agree that I feel fabulous after eating them though and need to do it more often! That spicy tomato sauce sounds delicious and is certainly calling my name right now! Beautiful lunch bowl and potatoes are my favorite food! Hey, Brandi 🙂 Yes I totally understand what you mean. In the past, I ate all (almost all) veggies cooked but some years ago I looked more into raw foods and intermittent fasting and since then I only eat one cooked meal for dinner and until then I eat raw. I know it’s not for everyone but it helps me to be more focused and my skin also got more clear since I do this. Thanks for your kind comment. 🙂 Lots of love to you ???? Ela, I did try the potatoes and love them prepared this way. So easy and simply beautiful on the plate! Perfect with the raw veggies, too! Love the tomato sauce with it! Thanks for the recipes and inspiration. God bless.